Ah, dating. It's a funny old world. Back in the '90s, it meant ringing each other's house phones (only your cool best mate had a mobile) to organise a meetup in your local pub, complete with a pint of snakebite and a packet of Scampi fries. Now, it's all about finding each other on a smartphone app and then deciding which pop-up taco joint you're going to sip overpriced margaritas in. But while the awkwardness of first dates never goes away (we hate to break it to you), it's getting harder to make an impression, thanks to the sheer volume of people using apps. According to research from 2016, a quarter of the UK uses dating apps (yes, some of those people are already in relationships). With the likes of Tinder, Bumble, and Happn using photos as the first thing you see in a prospective date, you can see why we think it's getting harder to stand out. So if you're currently dating and using an app, what should you do? Tinder, which has amassed 25 million users since its launch, gave us an interesting insight into how to make your profile more interesting, and it has everything to do with fashion. Want to know what it was? Keep scrolling for that, plus other tips on what to wear. Recently, Rosette Pambakian, head of marketing and comms at Tinder, revealed that avoiding neutral colours was key in making your profile the best. "We recently conducted a study that showed that the majority of Tinder users wear neutral colours (black, white, navy, gray, etc. )," she tells us. "So if you really want to stand out, show a pop of colour in your outfit." Luckily, the upcoming autumn/winter 2017 season is full of colourful trends. Keep scrolling to see the five hues you'll not only wear for a great profile but to be on trend too. Two birds, guys, two birds. 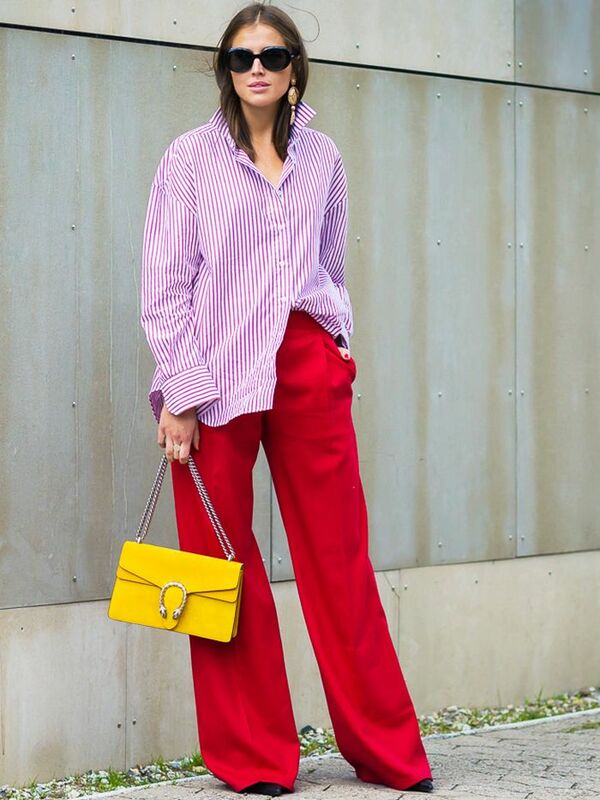 Style Notes: Do we need to tell you how flattering red is? Turns out, it's the colour that pretty much suits everyone. Basically, you can't go wrong. Pair with a white tee. Style Notes: Thanks to Pantone dedicating a new purple tone to Prince, not to mention that tonnes of designers for A/W 17 showed a range of purple hues, it makes sense that this is a huge colour. Whether you decide to go for a regal hue or a more subtle mauve, there's plenty to make you stand out—follow our guide on how to wear purple if you're unsure. Such a cool pair of trousers. Style Notes: There is no escaping pink these days. You can opt for the millennial kind or just do a blush or pastel. Interestingly, the colour psychology of wearing pink (yes, it's a thing) indicates someone who is calm and optimistic. Simple but will still stand out in a profile. Wear with blue jeans. Style Notes: Colour specialist and executive director of the Pantone Color Institute, Leatrice Eiseman, says that yellow is associated with happiness and can even make people feel enlightened. Whether you're all about making people feel happy or (still) love Emma Stone's yellow dress in La La Land, that's fine by us. Style Notes: Another colour that popped out at us on the A/W 17 catwalks was green in many different shades. Try it with a red lip and you're doing it right. Next up! The biggest autumn/winter 2017 fashion trends you need to know about.